How to watch Born on the Fourth of July (1989) on Netflix USA! Sorry, Born on the Fourth of July is not available on American Netflix. We check Netflix hundreds of times a day, so you can check back regularly to see when it appears for streaming. 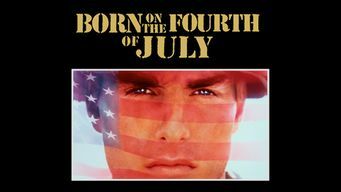 We'll keep checking Netflix USA for Born on the Fourth of July, and this page will be updated with any changes. Paralyzed from the chest down, U.S. Marine Ron Kovic returns home from Vietnam and finds renewed purpose protesting the war he once proudly fought. A gung ho soldier returns to the U.S. disabled and disillusioned. Will working against the war bring him any peace?